The shoreline data option can be used to enter depth data for places you cannot reach using your vessel, for instance, because the water is to shallow. It can also be used to specify a line of equal depth, for instance where the water reaches the shore. 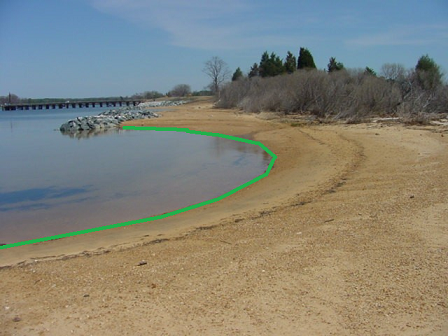 In order to draw a shoreline using hand, for instance when it is possible to use a accurate map, select the "Draw Boundary" option from the "Cursor" menu. Now you can click the points that make the line segments for the shoreline. When finished, just click the right mouse button to store the line. 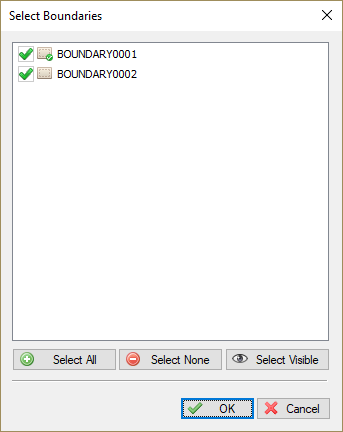 When you finished drawing the shoreline the "Edit Boundary" dialog box will appear. A shoreline is basically a special type of boundary in Hydromagic. 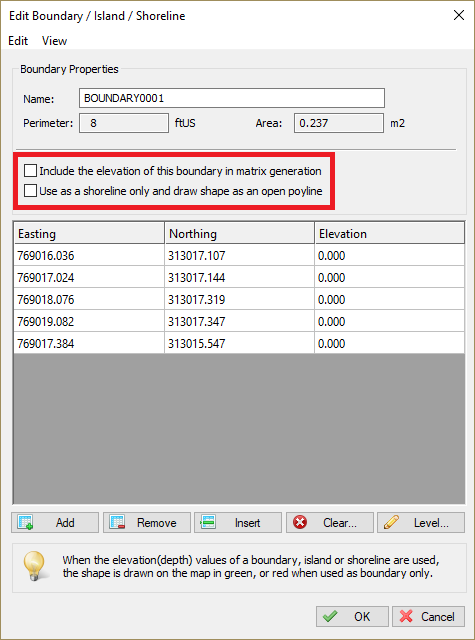 "Include the elevation of this boundary in matrix generation"
You can set the Z-values for this area so the depths or elevations along the boundary line is taken into account when generating matrices or performing volume calculations. Use this option when you want to define an island or the shore of a pond of lake and you want to set the depths or elevations at the shore(s). When an area contains Z-values (shoreline data) it will be drawn in GREEN. 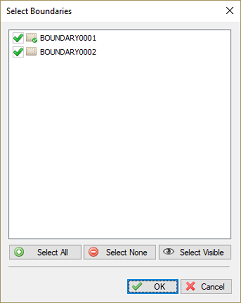 When neither of the shoreline option are checked, the area is used as boundary / clipping area only and will be drawn in RED. 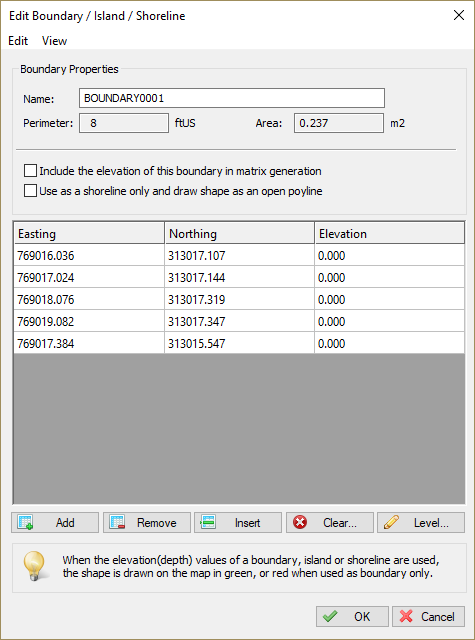 "Us as a shoreline only and draw shape as an open polyline"
When selecting this option, all points on the line will have Z-values which will be included on matrix generations. Since the line will be treated as an open polyline, it cannot be used as boundary or island shape. 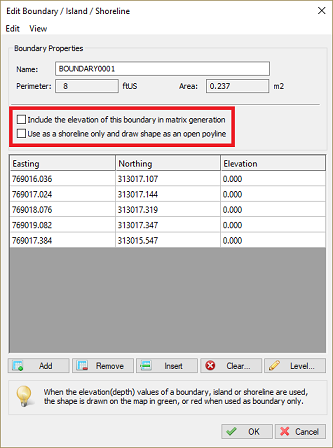 Use this option to include a single shore on one side of an area with additional (manually measured) depth or elevation points. 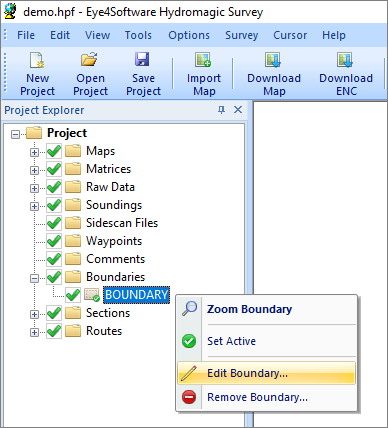 When you want to enter the shoreline manually, for instance when you have measured the shoreline coordinates from the shore using a RTK rover, right click on "Boundaries" in the "Project View" and select "Add Shoreline". The following dialog should now appear, allowing you to enter all measured coordinates in the spreadsheet. Click the "Add..." button to add new records. you can set all Z values at once by clicking the "Level..." button and entering the value. To modify the positions in shoreline data, you can use the mouse to drag and drop the positions on the map. When you want to modify positions manually, or you want to alter the depth values, you have to use the "Edit Boundary" dialog. 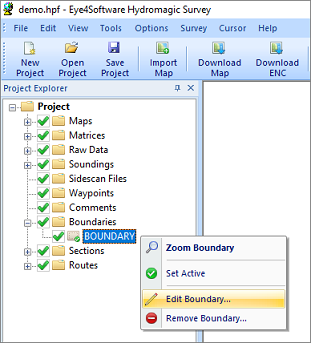 To open this dialog, right click on the boundary you want to modify in the "Project View" and select the "Edit Boundary..." option.